Bushwick in Brooklyn is indicative of a certain kind of inequality in America. Walk five minutes west from Jefferson Street towards Manhattan and you’ll find white students in coffee shops tapping away on expensive MacBooks. Walk five minutes east and you’ll encounter all the familiar markers of metropolitan – in this case black and hispanic – poverty: inadequate housing, understocked grocery stores, and big plots of empty, overgrown land. In contrast to Hillary Clinton, his chief rival for the Democratic Party’s 2016 presidential nomination, Sanders is a legitimate political outsider. Although the 74 year old frequently votes with the Congressional Democratic caucus, he sits in the Senate as an ‘independent socialist’. He won’t accept money from ‘corporate interests’. (The $26million he raised in campaign contributions over the summer came almost exclusively from small individual donors.) Despite his growing popularity, his support in the mainstream media is limited. But Sanders’ unexpected and impressively sustained assault on the Democratic establishment owes as much to the substance of his rhetoric as to the rhetoric itself. Sanders has built his campaign around two core themes: the widening wealth gap and the long-term decline of the American ‘middle class’ – a catch-all term encompassing everyone but the very richest and very poorest Americans. The statistics are striking. In 1981, 59 percent of American adults were classified as middle income. By 2011, that figure had fallen to 51 percent. Over the same period, middle America’s share of the national output shrank from 60 percent to 45 percent. Last year, according to the US Department of Social Security, just over half of America’s workers – upward of 100 million people – earned less than $30,000 (£19,000) per year and nearly 40 percent earned less than $20,000 (£13,000). ‘Sanders 2016’ has gained traction because middle class living standards have not kept pace with economic growth, and because – even now, seven years after the election of Barack Obama – the benefits of that growth still concentrate disproportionately in the hands of the rich. The closeness of the Democratic leadership (particularly Clinton, who receives hundreds of thousands of dollars in funding from Wall Street) to corporate America has also convinced many activists that a conventional candidate might struggle in what is shaping-up to be an unconventional presidential race. There are, however, sizeable obstacles blocking Sanders’ path to the nomination. Foremost among them is the overwhelming whiteness of his support. A CNN poll earlier this year put his backing among non-white Democrats at just 9 percent and a recent Fox News poll suggested that only 5 percent of African-American Democrats planned to vote for him in the primaries. As well being almost uniformly white, his followers tend to be young, college educated and professional. In other words, in the looming face-off against Clinton, Sanders will thrive in one part of Bushwick but lose badly in another. He’ll carry Vermont, the whitest state in the Union, but not South Carolina, one of the most racially diverse. The Sanders’ strategy is to reassemble the coalition that launched Obama into the White House in 2008. (Seven million more Americans voted in 2008 than in 2004.) But that coalition was multiracial. It included a huge numbers of black and hispanic voters alongside women, the low paid and white liberal graduates. Unless Sanders can attract a similarly expansive alliance – and soon – it is difficult to see how his campaign can advance on what it has achieved so far. The irony is that Sanders – a Brooklyn socialist of Jewish extraction – is much better placed than Clinton – a liberal WASP – to understand the complexities of race and class in modern American politics. Perhaps, despite the heavy and persistent Flatbush accent, he has spent too much time in Vermont. Or perhaps he just needs to sharpen his message. He could start by talking more about the inequalities that exist within middle America, as well as those that exist between middle America and the rest. It would, of course, be naive to bet the house on Bernie Sanders taking the Democratic nomination, far less the US Presidency. And even if he managed to squeeze in we know corporate interests would galvanise their media machines like never before to crush him and his supporters. That said, politics is becoming increasingly unpredictable. The 2008 crash has altered everything in the most fundamental way, with the full repercussions yet to be felt. Old certainties are falling down as the madness of the market continues unchecked and unregulated, corruption bites deeper into our polity and the hubris of the rapacious right grows daily. So don’t bet the house on Bernie – but don’t write him off either. Few could have guessed that a socialist politician could get so far up the ladder in U.S. politics when it has been dominated by two right wing parties for decades and with the McCarthy witch hunts still within living memory. Though, maybe in some ways it is inevitable in terms of it being an opposite, though maybe unequal reaction. Maybe real democracy is still in operation in the U.S.- though, would the billionaire class who operate and control both Republicans and Democrats ever really let Bernie Sanders take power, especially if he intends to curtail their gilded lifestyle and their unrestrained influence over U.S. economic and foreign policy and the media? Why, in this present age of progress through undreamt of technoligical innovation and miraculous communication systems via the global internet do we witness statistics of huge inequality like that mentioned in the article? Poverty and instability are still rife while a tiny group, who believe themselves an “elite” fill their coffers on an unprecedented scale. Our flawed notion of what is progress needs to be re-examined. Its good to see Bernie Sanders have a go at vulgar wealth. Visit any of their huge factories, warehouses, corporate eateries or supermarkets and you will soon become aware of the tight measures that have been put in place in the name efficiency. Jobs are lost, wages cut, workers rights diminished – all in the name of efficiency towards increasing profits. Yet, the benefitting billionaires are by definition the most inefficient section of our global society even though they are in such tiny numbers. What is efficient, in an age of growing and extreme poverty, in having a plethora of lavish houses plotted around the most expensive neighbourhoods in the world? How many prestige cars, massive yachts or luxury private planes can a man travel in at any one time? No one person can ever earn a billion by their own efforts, they can and do purchase the levers that open the banks doors or pressurise policy makers. Let’s stop focussing on the patholgy of the poor and disposessed and start examining the addictive mentalities, psychopathy and sociopathic tendencies of the filthy rich! These people are not the icons of success they are portrayed to be- they are a gross failure in human and cultural terms and are probably causing and/or exacerbating the biggest dangers yet seen to humanity and the natural environment, which ultimately sustains all life and, in turn, every economic system. You, me and all that lives upon the planet are but expendable commodities in the minds of those who are addicted to wealth and power. To them we are either potential consumers, coolies or cannon fodder. Let’s stop regarding them as something to aspire to, not even a lottery win would come close to this level of obscene wealth. We should not consider them as the norm, a fact of life or something we just have to put up with because they create innovation and jobs. I would say they prevent innovation- if it is not profitable to them, and that slavery also creates jobs. This goes beyond the old paradigms of left and right. Due to the global scale of damaging human activities the earth itself is at now sadly at great risk putting even the survival of all life, ironically even those of billionaires, in jeopardy. We need to get our hands back on the levers and make our systems work in favour of life and not money. Good to see America getting its political balls back and that the left are back in the arena. New ideas, and some old ones too, will be vital to re-energise a system toxified by years of neo-cons. If Bernie Sanders does nothing else I at least hope he awakens the America that has contributed much to our cultural life in the modern age. Lastly, I still feel we all need to respect the Earth and learn from the indegenous Americans who were nearly wiped out by the henchmen of genocidal Western speculators a century and a half ago. As we used to say when I was a kid jumping at great risk into the air from a stinking tenement bin shed- Geronimo! Google ” altemeyer, authoritarianism ” and follow to the free PDF download. A short read. It illuminates much. Another excellent read is ‘Psychopathic Cultures and Toxic Empires’ by Will Black, a former Mental Health professional who also writes occasional articles for the Huffington Post. Chilling but for me provided the final piece to the jigsaw. Thanks Andy and Gralloched, will check out your suggestions. Very interesting and, with regard to the lack of support among the black and Hispanic population, very surprising. Could this be because of friction between the outgoing president and Sanders? The similarities between Bernie and Jeremy Corbyn are apparent. Both seem to be loathed by organisations that should be embracing them. I have no idea either why Bernie Sanders has (to date) had low support among the black and hispanic populations. Or, to be more precise, why black Democrats should be so solid for Hillary, who (it is blatantly obvious to me) will always place Wall Street’s interests over their own. Perhaps some Americans reading this site can help out? Jamie’s last two sentences seem to me to contradict each other: “Or perhaps he just needs to sharpen his message. He could start by talking more about the inequalities that exist within middle America, as well as those that exist between middle America and the rest”. 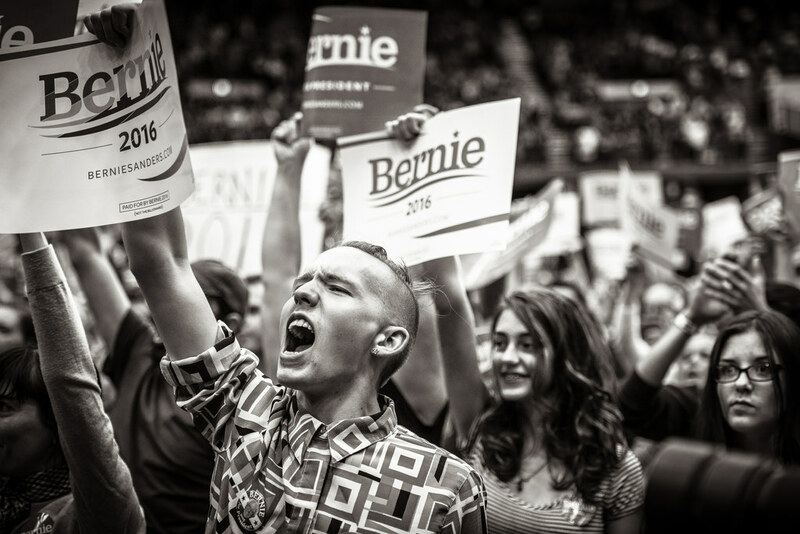 Bernie’s message, as far as I can understand it, is to say that the 1% (or the “billionaire class” – the 0.01%) have bought the political system and there’s nobody you can vote for anymore who will act in your interest, they will all act in the 1%’s interest. 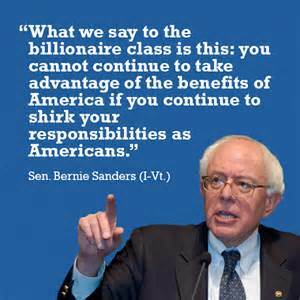 What he, Bernie, will do, is break the 1%’s financial & lobbying stranglehold over Washington and make the 1% pay more taxes. If you tax the 1% properly, you can do great things & offer a better welfare state without needing to tax any part of the 99% more. People can barely believe this is true, because they are unaware of what an extraordinarily high share of income & wealth the 1% are currently grabbing. So his core message is that the 99% need to worry less about what divides them, and worry more about uniting to take on the 1% – essentially a traditional socialist/marxist message that there are only two classes out there that really matter. Don’t let them divide you into races & fine social class distinctions, all the better to rule you. Is Jamie saying that the black community don’t buy this, and neither should we Bella readers? I’m not sure if Jamie is suggesting that he should change his message to focus on what he’s offering to the black population as people who are disproportionately represented in the bottom 10%/20%/50% of the income & wealth distribution, or whether Jamie is suggesting he needs a different message of arguing for racial equality over income & wealth equality (“let’s get more black folks into boardrooms” type stuff). I hope Jamie can perhaps add to this post and say more.